Baja cuisine focuses on freshness and these tacos certainly highlight fresh and colorful ingredients such as lime juice, tomatoes, corn, avocados and cilantro. The seasoning for the chicken is not spicy, but rather refreshing with the additional of fresh lime juice it's tossed in prior to sauteing. Once the chicken is cooked, it's placed in warmed tortillas and topped with one of my favorite salads - black bean and corn salad. I chose to use this salad in the tacos because it has a lot of great textures and flavors that pair well with the seasoned chicken. 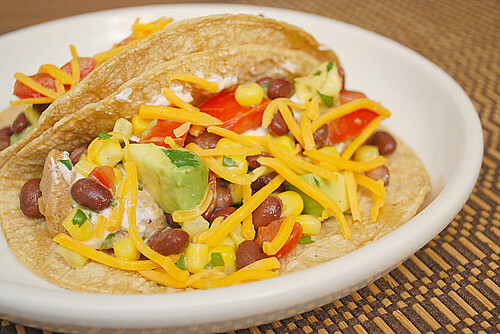 If you're looking for a different twist on the usual chicken tacos, give this one a try! Combine the cut up chicken breast, seasonings, fresh lime juice and 1 teaspoon olive oil in a large bowl. Toss to season chicken thoroughly. In a large skillet over medium high heat, add 1 tablespoon of canola or olive oil. When the oil is hot, add the seasoned chicken and saute until cooked through. Remove from heat and set aside. Heat tortillas per package directions. Fill tortillas with sauteed chicken and garnish with your choice of garnishes and black bean & corn salad. Love the look of these tacos! I love just about any kind of Mexican food but these really sound delicious and refreshing with the lime juice! Oh and I'd like to take this opportunity to invite your supporters and friends on this blogsite to check us out at some of our upcoming shows in the City starting with our Debut show at Silvie's Lounge in Chicago (Irving Park and Damen). Details are on our Official Facebook Page..